The phrase “for the first time” has been used several times this year, but UCF fans won’t mind it being used at least one more time, as the No. 12 Knights have secured a spot in the Chick-fil-A Peach Bowl for the first time in the schools’ history. The recently crowned American Athletic Conference champions UCF (12-0, 8-0 AAC), will battle Auburn (10-3, 7-1 SEC) on January 1 in a New Years Six bowl game, reported first by Brett McMurphy. The Tigers fell 28-7 to the No. 3 Georgia yesterday in the SEC championship game. As a result, the two will meet up in Atlanta, Ga. on New Years Day to battle it out at Mercedez-Benz Stadium at 12:30 p.m. While the Tigers are five-time veterans of the Peach Bowl, the Knights will look to made a big impact in its first appearance. 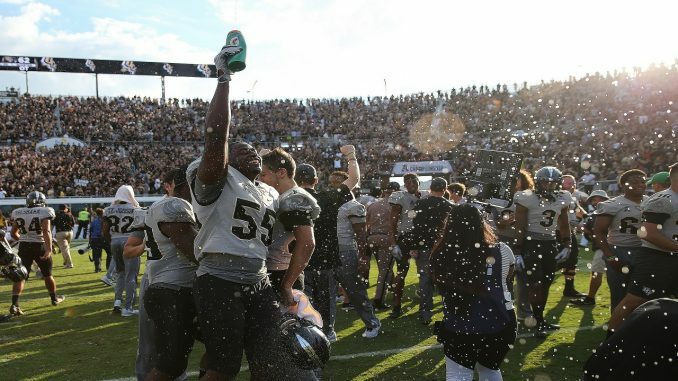 Last year, UCF went to the Cure Bowl after finishing the season 6-6 just a year after UCF went 0-12 in 2015. It was former coach Scott Frost’s first year at the helm for UCF. The last time the Knights won a bowl game was when UCF beat Baylor in the Fiesta Bowl in the 2013 season.